JAL comes in the Paul Woolford Vocal remix and Sunrise Dub. Play Pig in the Buick Project Remix 1 and 2 versions. If you aren't able to spin vinyl, this a way to get those tracks. UWlive says they will be there later too. You can either download in 320 CBR mp3, .Wav or M4a 192 VBR. Buying the tracks in .wav costs 1 euro extra 'handling fee', per track. There isn't any artwork to download there. I think that stinks. Bad. Today there has been an update of the underworldlive.com members website. News about version 2 of it and future plans. Also the archive has been updated with more downloads of Benicassim. My main other hobby besides Underworld is photography. I own a dSLR since november last year. 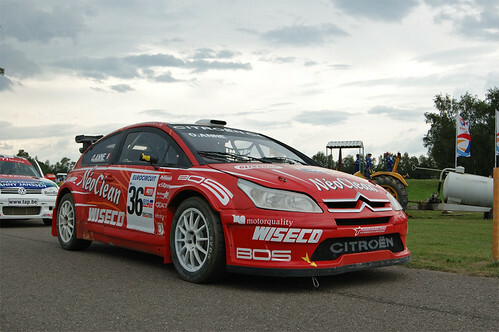 This is a shot I like very much, shot during the EC rallycross at Eurocircuit in Holland. There are couple more shots of this event where I'm a volunteer for over 25 years already, here. This weekend some underworld (or related) tuned were played. There is a big review of all the riverrun releases at Popmatters. Today there was a post about underworld at AOL music news blog. Not much news there, other then that they are working on the danny boyle movie soundtrack. Normally I wouldn't post a link to anywhere where there are mp3's of official released songs, but this a hard to get 7" single by Screen Gemz released in 1979. Killed By Death Records has written a review about the Teenage Teenage/I justcan't stand cars 7" single. Radio docu about the Exit festival where Underworld preformed last year. Also in this one Karl is interviewed about it. edit: link there is faulty and gives a docu about the Glasgow music scene, I hope they will correct it. Update: I found another page for the Exit festival docu, link updated. Now the realaudio file is correctly linked. Update II: Only a tiny bit of Karl and Underworld in it, only the first few seconds of the Exit broadcast we already know. Here you can listen again to a 30 minute BBC radio docu about Kraftwerk. Amongst others, karl was interviewed about them. You can see the video here at youtube. DANIELLE is an exciting young singer that first appeared on Australia's Big Brother on the Ten Network as an intruder housemate. Danielle impressed Australian audiences with her friendly and fun nature as well as her stunning looks. These things aside, it wasn't long before viewers also noticed Danielle's singing. DANIELLE kicks off her recording career with Underneath the Radar, a former number 1 smash hit by UK act Underworld, selected and produced by electronic outfit My Ninja Lover. Tracking and mixing of the song was undertaken at Jumpstart studios, with local legend Mark McGelligot (Powderfinger, Bernard Fanning), the track was then mastered by Mickey Levis (Garbage). The next Ministry of Sound Sessions 2CD contains a mashup of Axer - 1.2.3 + Underworld - Two Months Off. There's an offical website up now for the concert in Riga, Latvia. There are 3 promos for sale for a ridiculous price at Ebay. But it gives us a chance to see what's there. 2. Play Pig (Pig & Dan Mix 2) cdprint is wrong, has pig&dan mix1 on it. Today Karl writes that they were interviewed by mixmag. I think it was an interview with underworld and Gabriel Yared about the fortcoming soundtrack because he wrote that he was interviewed while being on 'the master's' piano.. So keep an lookout for upcoming issues of mixmag's for this. Today Perou (scroll to bottom there) did a photoshooting with Underworld and Gabriel Yared, for promotional pics I guess. Location was the roof of the Abbey Road Studio 1. This site has a new date for an Underworld concert listed. Not listed at the UWlive site yet tho. EIL.com has listed the Breaking and Entering soundtrack cd, japan version. Cream Summer 2006 is out. On CD3 18. Underworld - Born Slippy. Manumission Ibiza Classic Collection. On CD1 10. Underworld - Born Slippy. 7. Underworld - Pearl's Girl (AFK's craZy Edit) [CDR] 39:55 into it. 6. underworld vs lustral - everez time - jason dunne mash up 31:45 into it.